FILE - Kenyan men from the Sengwer community protest over their eviction from their ancestral lands, Embobut Forest, by the government for forest conservation in western Kenya, Apr. 19, 2016. In Kenya, members of the Sengwer community who live in Embobut Forest, 400 kilometers from Nairobi, are facing eviction from their ancestral communal land. The government has deployed security forces to evict the group in an effort to preserve forest cover. Thomas Chelimo, 78, and his wife, Pauline, have called the Embobut forest home all their lives. On January 1, their home and the homes of others were razed, allegedly by Kenya Forest Service (KFS) rangers in a bid to force the Sengwer out of the forest. The forest is a critical water supply area. Chelimo, who was born and raised in the forest, as were his father and grandfather, says that the forced eviction by the government agency will render the community homeless and landless. Chelimo says his children and grandchildren ran away because of fear of eviction. 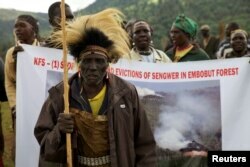 FILE - People from the Sengwer community protest their eviction from their ancestral lands, Embobut Forest, by the government for forest conservation in western Kenya, April 19, 2016. Leah Toroitich and her husband, Abraham, say the government initiated a compensation program about three years ago where resident families were given $4,000 each to relocate. However, they say, genuine community members did not get any money. The European Union (EU) is funding a $37 million, six-year program to protect the ecosystem. International law expert Roselyn Amadi says the Kenyan constitution protects the rights of the Sengwer. "There is this dichotomy that if they are there, they are destroying the environment, and I think that is what has happened and that is the conflict that we are having," Amadi said. "So whereas you have the right to preserve the environment for present and future generation, you also have the issue of development and you also have the issue of the rights of the cultural people." Amnesty International Kenya campaign coordinator Naomi Barasa says the eviction of the minority community from their indigenous home is a violation of the fundamental right to shelter. "Kenya as a state is going against regional, international and local treaties that safeguard human rights because the Sengwer issue, the rights of the indigenous people, rights to their housing are anchored in our constitution and in international law that Kenya is a treaty to, so it is purely a human rights issue and it also affects the lives of the people," Barasa said. The Kenyan government has not responded to VOA's requests for comment on the evictions.